And one cup for you! Oh, did you want marshmallows? Do you like my tea cups? Tea cups are perfect for hot chocolate! 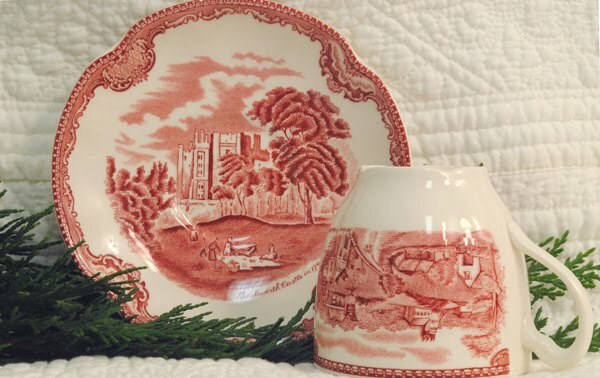 This pattern is called Old Britain Castles. I know you have seen this one before. I do love the patterns and the color. It was almost dark when I had this tea and took the photos, so my pictures do not recreate the correct colors, some pics are closer than others. I enjoy using this set in the fall and at the holidays. The plates and cups have different castles on them. 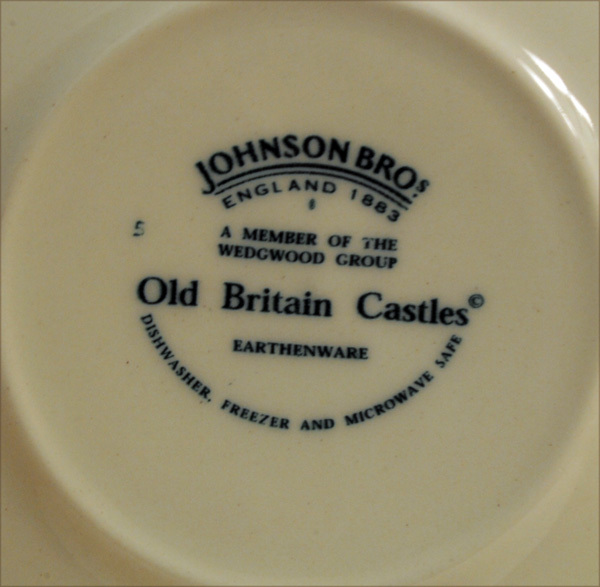 This set is made by Johnson Brothers. They are a famous maker of dishes. This set is earthenware, which is not china. 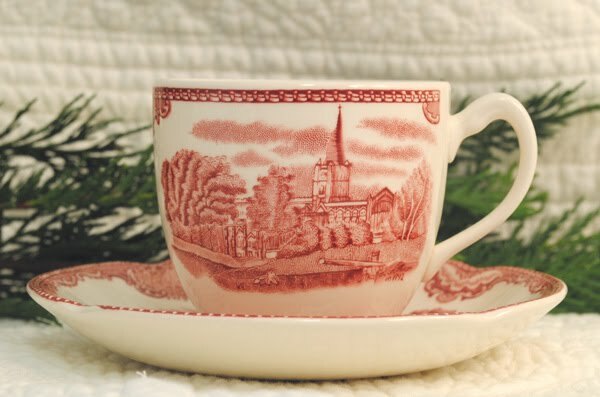 Bone china is made from bone ash and fine white clay, earthenware is made from clay and sand. The heat temperature and processes are different for each. Bone china goes through a chemical change, where earthenware is clay that is baked hard with heat, no chemical changes take place. This is just a simple explanation, there are some of you out there who are experts on this and could explain it much better. so you don't have to refill them very often during a dinner. This is the matching tea pot....which I must say I adore! I love all the scenes and details. Thank you so much for stopping by again today. I am so glad you are here! 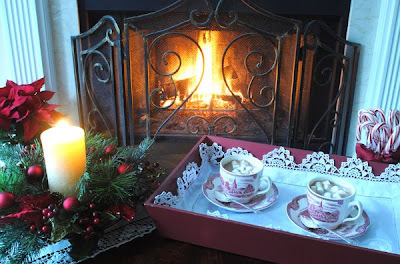 Below in my last post is a Christmas with Victoria blog party post. Within it is a Free Video demonstrating how to make a Vintage Holiday Banner. If you would like to join in this weeks Tea Cup Tuesday, just fill in the two blanks below and Mr. Linky will automatically add you to the list of places we can visit. Post about your special tea cups! We would love to see them. Please make sure you have tea cups in your post. Oh, your hot chocolate by the fire looks so cozy and yummy! And your tea set is beautiful! Love the colors, and the patterns are wonderful! 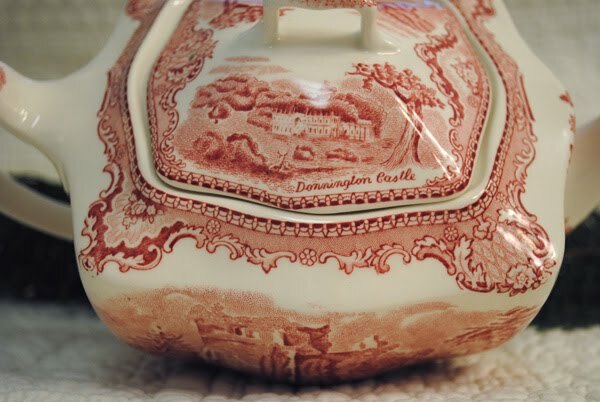 Terri, I love seeing this china ( earthenware)! Everything about it appeals to me and your setting is so inviting I think I will join you for hot chocolate and marshmallows~ thank-you! I am now going to check out your previous post and the video, but first another cup of cocoa please? Dear Terri your cups and teapot are reallly gorgeous! and this hot chocolate with... marshmallows?! sounds very tasty, it´s new for me I have to try! Such a lovely set...I love big creamer jugs...For me it spoils the mood if I have to keep getting up to refill instead of just relaxing. I posted something a little different for tea time this week, if you would prefer it not be a part of this weeks teatime then please feel free to delete the link. 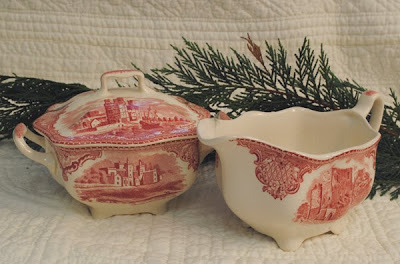 Hi Terri, I love any china in red and white! 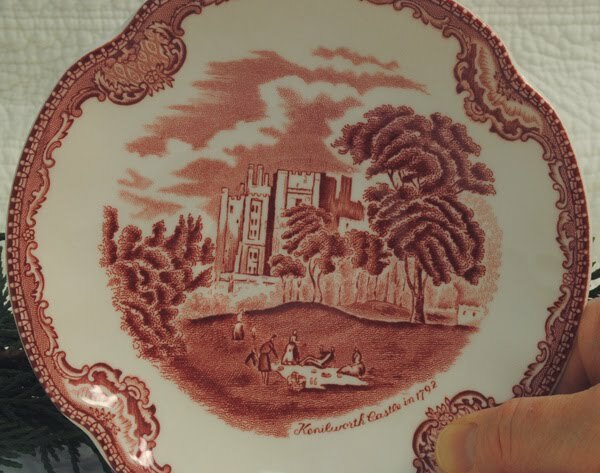 I have one plate in the castle series and am always on the lookout for others. We have a fun collecting hobby, don't we! This is a beautiful setting for hot chocolate by the fire. I have Old Britain Castles too. Thanks for explaining the difference between bone china and earthenware. And is stoneware different yet too? I really like your serving pieces too - great teapot! Merry Christmas to you! oh how lovely! I could love a cup of that hot chocolate! Looks so yummy! Wonderful photos! Your hot chocolate by the fire looks lovely. I really like the Old Britain Castles pattern. The teapot is gorgeous. Hi Terri...an absolutely beautiful post..this is a set I have had my eye on for a loooong time..and hope to have it one day!! For now..it is wonderful to see the magic you have created with it here and enjoy it from afar....gorgeous and outstanding...you are marvelous!! thanks for this magical post! Well, Terri, I am a big JB fan, so I am loving your red transferware! The hot chocolate looks wonderful in the cups! Very cozy setting by the fire! Thanks for sharing and have a lovely week. Terri, your set is very nice. I didn't know the difference between china and earthenware, so thank you. 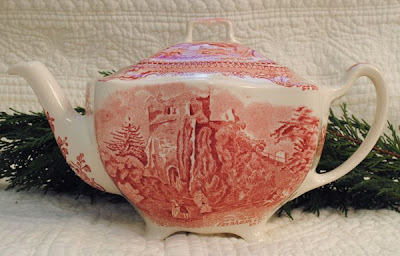 I have a small set of pink toile design on cream, made in England by Wood & Sons. They were given to me by a dear friend, and are a treasure to me. 'Tis the season for hot cocoa...and yours looks yummy! Sometimes I will add a mini scoop of good vanilla ice cream...Happy sipping!! Hi Terri...I love this post! yes, I was posting today about tea time and how romantic it is...and besides enjoying a nightly cup of Green Tea...I am mostly a coffee drinker! but, I must say that I have recently become a hot cocoa lover...and yes! the thought of using my bone china pretties sets me on fire with domestic delight! thanks! I'm joining in for tea time today...on the list already! This is so precious!!! I love this post--and it must have taken forever to do...you are amazing at all this!!!! Gorgeous teapot! I love Johnson Bros. but only have one coffee cup that I just picked up this fall. Thank you for visiting my blog and inviting me to join the party. I linked up. Thank you ,I love it! What a beauitful set Terri. Do love that red desgin! Thank you so much for the delicious cup of hot chocolate :-)Oh and also thank you so much for your sweet comment and for becoming a follower...It is always so exciting to meet new blogging friends. Hope you come and visit again soon. Have a wonderful evening. I think hot chocolate tastes even more delicious in teacups. Your pattern is lovely and beautiful for the holidays. Your tea set is really beautiful. The entire set! I would love to sit here by the fire with you and sip my cocoa and chat. Do you think I could have a few more mashmallows??? I have a thing for them! Thank you so much for your visit and your dear words. You must be a wonderful hostess! Your home and cups are lovely!! 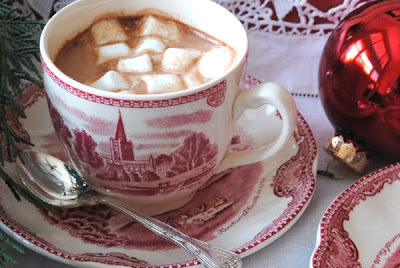 red transferware teacup with hot choc and marshmallows just yummy! especially on cold weather like this and also this season of sharing.. just perfectly cozy and warm! wonderful feeling Terri!. have a great day! mmmmmm, this looks divine! the photo by the fireplace is so inviting and gorgeous. I'll take a few marshmallows, please. I posted the shoes and hope you'll come over and see them...I know people will be visiting!!! I absolutely adore your 'castleware'! Thank you for sharing a bit of Old World to brighten my day. Your blog is warm, wonderful, and inviting. I can't wait to see your future posts!! I noticed after I posted, that I also have a Joy frame & quote on my tea table (in my first 2 pictures)! Joy ... a great theme! What a pretty post with your red dishes! I have just a few pieces of these dishes and do so love them. They all are in imperfect condition but show them off with pride anyways! I do so hope to join you some Tuesday- I do love a good tea party! Wow! So very beautiful! 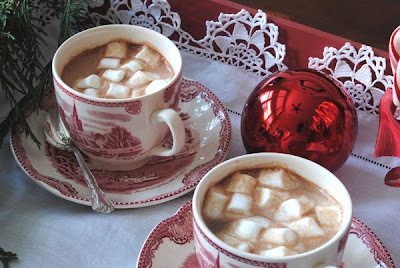 The hot chocolate with marshmallows...oh yum I want some...Such a wonderful collection of china. It is so calming and beautiful to come here. I am so glad you create. Your vision is so dear and delicate. Thanks friend. Blessings. Wow, I just had a wonderful journey through your blog. So many beautiful tea cups!! My mum had a love for tea cups, when ahe passed away I got her collection. I am very inspired by your beautiful photographs to get mine down from the loft. I just had to sign up to see moe of your beautiful creations too! beautiful post and such a gorgeous set. I love seeing the warm hot chocolate in the cups...it will be a high of 13 degrees in Michigan today! What a gorgeous set of dishes, Terri!